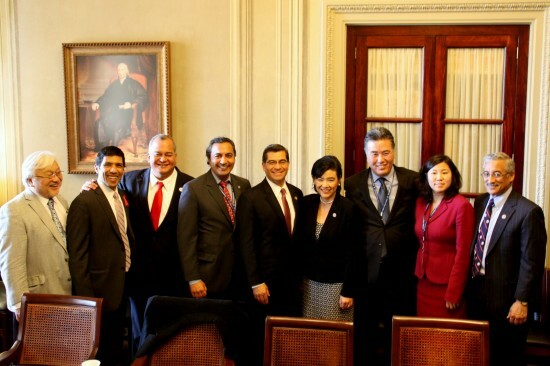 Pictured at a CAPAC meeting last November are (from left) Rep. Mike Honda (D-San Jose), outgoing Rep. Hansen Clarke (D-Mich.), Rep. Gregorio Kilili Camacho Sablam (D-Northern Mariana Islands), incoming Rep. Ami Bera (D-Rancho Cordova), Rep. Xavier Becerra (D-Los Angeles), Rep. Judy Chu (D-Pasadena), incoming Rep. Mark Takano (D-Riverside), incoming Rep. Grace Meng (D-N.Y.) and Rep. Bobby Scott (D-Va.). WASHINGTON – Seventy one years ago today, President Franklin D. Roosevelt issued Executive Order 9066, which led to the internment of over 120,000 individuals of Japanese ancestry during World War II. Rep. Judy Chu (D-Pasadena), CAPAC chair: “On the Day of Remembrance, we reflect on our responsibility to pursue and protect the civil rights of all Americans. Executive Order 9066 established an unconscionable policy that upended American families and imprisoned them in deplorable conditions because of wartime hysteria and racism. “Twenty five years ago, our government finally apologized for these transgressions and provided reparations to Japanese American survivors of internment through the Civil Liberties Act of 1988. The former shows what can happen when we fail to remain vigilant, and the latter demonstrates our ability to recognize our wrongs and move forward as a nation. Rep. Madeleine Bordallo (D-Guam), CAPAC vice chair: “I join my colleagues in remembering the thousands of Japanese Americans who were forced into internment camps during World War II. Executive Order 9066 marked a bleak point in our nation’s history — one of racial prejudice and wartime hysteria. As we commemorate this dark event to shed light on our past, I am encouraged that the 113th Congress is the most diverse Congress in history. Rep. Mike Honda (D-San Jose), CAPAC chair emeritus: “In 1942, some 120,000 Americans of Japanese, Italian and German ancestries were rounded up in this country and incarcerated. Families were torn apart. People’s livelihoods and properties were sold for pennies on the dollar. American civil liberties evaporated overnight, only to be caged behind barbed wires. “I spent my childhood, alongside my family, in the Amache internment camp in southeast Colorado, the experiences of which shaped my political beliefs and outlook on life. “This year marks the 71st anniversary of President Roosevelt’s signing of Executive Order 9066, which authorized the incarceration, and the 25th anniversary of the Civil Liberties Act of 1988, which formally initiated the healing and reconciliation process for those Japanese Americans who were interned during World War II. The purpose of the Day of Remembrance is to preserve the lessons from this shameful chapter of our nation’s history. Rep. Jackie Speier (D-San Mateo): “Seventy-one years ago, over 120,000 Japanese Americans were ordered incarcerated by President Franklin Delano Roosevelt and his Executive Order 9066. 8,000 Japanese families were rounded up like animals and forced to live in horse stalls at Tanforan Racetrack. Tanforan is in my district and though currently a shopping mall, a small memorial can be found there to honor those who were interned. CAPAC said in a statement, “EO 9066 authorized and facilitated the wholesale removal of U.S. citizens and ‘enemy aliens’ of Japanese ancestry from the West Coast, which led to their incarceration in Wartime Relocation Authority camps. It also created an individual exclusion program that allowed the Army to move naturalized citizens of German and Italian descent from military areas across the country. These individuals were wrongfully detained on no other basis than their heritage; none were found guilty of the sabotage and espionage charges against them.